A long, sloping bonnet? Side pipes between the doors and front wheels? No windshield? Silver? 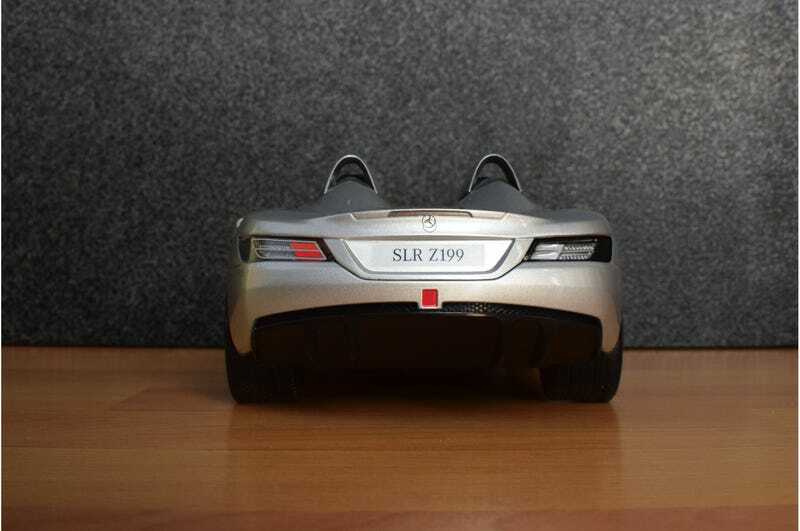 2009 Mercedes Benz SLR Stirling Moss is the answer you were looking for. The lightweight, limited edition, higher powered version of the Mercedes-McLaren designed SLR which, in itself, was designed to evoke something in between the 1954 300SL ‘Gullwing’ and the 1955 300SLR which Sir Stirling Moss winningly championed at that years Mille Miglia race. It is quite a departure from the usual fare of Mercedes Benz Special Editions That Are Actually Quite Tame. After all, it doesn’t have a real windscreen and sometimes doesn’t let you bring a friend along for the fun; compared to an SL Black Series this thing is just certifiable! 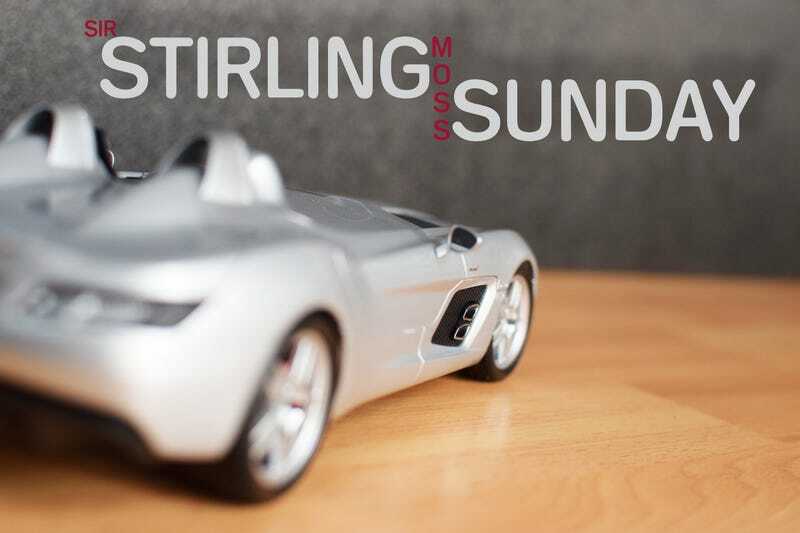 Today, let us have a look at a 1/18 Mercedes Benz SLR Stirling Moss by Minichamps/Paul’s Model Art. LaLD Community be warned; Lots of pictures... again. Let’s not muck about, that rear Mercedes logo is waaay off, and should have been completely unnaceptable under the standards usually displayed by either Minichamps or Mercedes-Benz and it detracts in all too-large of a way from the very unique design of the rear end and trunk opening on this special edition Benz. There is one other instance of this, the haphazard tossing of decals rather than placing them on the diecast model, and this is found on the drivers side fender, and concerns the venerated McLaren logo. Doubly unacceptable. As far as actual flaws go, this is it. No more complaints about sub-standard manufacturing and lax quality control from me! Seriously, I like this thing a lot. It is most assuredly my favorite version of the SLR, and while it wouldn’t be the one I bought as my only car, I’d gladly add it to my fantasy stable. Minichamps brings us a version that has many details worth the price tag, and some that are just a little sub-par in this application. Let us just take a look around and see. I much prefer these headlights to the stock SLR units, especially on the drivers side with that grille opening there. It harkens back to the 300SLR, like the one Sir Stirling Moss famously used. Like the rest of the grilles on this model, it isn’t a real opening here. The drivers side isn’t bad without the vent, mind you! The headlights are detailed to a nice degree, with the projector housings looking especially agreeable, even though they are no more than paint on a one-piece molding. The rivets are a nice touch, and are convincing enough without having any special demarcations like paint or decals to make them stand out. Underneath that hu-huuuge bonnet lies a 5.4 liter supercharged V8 running just under 1 bar of pressure to make 617 glorious-sounding horsepower in the road-going SLR. Here the engine is tuned for 640hp, and combine that with a 200+ kilo reduction on weight and the lack of a large, un-aerodynamic windscreen means this car could reach 220mph. That is 11mph faster than a standard SLR, for anyone keeping tabs. The clam shell opens up quite a ways, but access and view is still limited with this massive piece. That low-opening cannot hide the fact that the mid-front mounted V8 isn’t a gloriously detailed part of this model. The 1:1 car doesn’t have the most detailed engine bay in the world; it’s all covers and piping, BUt this is a little low in appointment. Minichamps did try to give us a little something here, and it comes in the form of nice little washer bottles. It isn’t an AutoArt Zonda motor... and those bottles should be black on the passenger side, but it’s nice. The valve covers are a appreciated little touch; chrome accents and a nice SLR logo. That last picture brings us to the proverbial elephant in the image. No windscreen. What you get instead are two little asymmetrically placed Brooklands-style screens. Separate and delicate parts here on this model, they are a a part of one of the highlights of this model car; the interior. The SLR and most of it’s progeny shared a vast amount of similarity in the interior department with the standard, non-McLaren, Mercedes SL class of cars. Admittedly the 722 edition and those following had carbon fiber components in place of the plastic bits all-around and that improved it in a way, making it feel more like a part of a special car. The Stirling Moss edition, however, received a very very bespoke interior. The console and dash are very special in their styling and the way they were redesigned to fit in this car. That shifter should have a little plate denoting the serial number out of the 75 total made, and an engraved Sir Stirling Moss signature. Also some of the paint isn’t quite on target, but the carbon is very nicely visible from further away, and takes the stress off of the rest of the interior as far as how eye-catching it all is. There is no possible way to get a good image of the gauges, as far as I’ve worked out with my camera and lens combo. I can report that they are nicely marked, and while they don’t shout about themselves like some other components here, they work with the other parts, mostly nicely detailed, to make a very very cool interior come to us in a well re-created way. It’s a good thing this car isn’t at AutoArt or Kysho pricing levels, however. You may have noticed the little cross-bar in some of these pictures. This model, like the 1:1, comes with a few extra pieces. Three components make up the ‘roof’ of the Stirling; a cross-bar and two seat/tonneau covers. Want to bring a friend today, or not? The cross-bar has little details on it ‘to fasten the roof’ which come off very convincingly here. Note the details on the roll-hoops. The seats are covered very closely, and that priapic bonnet continues to the seats whether the roof is on or not! I’d like to imagine that these three components fit into the cavernous trunk area, but truth-be-told I keep this car (and many others beside) in the box, in another box, to keep it clean/safe/whole/beautiful. I gave up my display case (read: former sunglasses display case) when I moved, but when I get another I think I’ll try to fit them. Safely. Nice detail for the filler cap. Also the doors do not open. The wheels both front and rear are well executed, and the tires pass closer inspection quite easily. Again, they aren’t at the top-level, but this car is priced at about half of what an average AutoArt would go for, so even some of the paint imperfections seen above can be forgiven to a degree. The brakes are visually quite alright, while the rear rotors appear ‘simple’ in a way, and the front rotors feature drilled holes that do not go all the way through. All in-all this car is a nice piece to have in a collection. The cost-cutting approaches are mostly hidden under that spectacular and unique bodywork, and the flaws on mine are not too common as I understand. If it can be gotten at the regular $90ish or thereabouts, it is a nice a worthwhile model. I’ve seen a few orange ones around going for a lot more money, but personally I’m a fan of the silver. Minichamps does quite a faithful job of bringing us a scale version of a very special car, itself an homage to another very special car and man. Okay, so I’ve had this Maisto 1/18 1955 Mercedes-Benz 300SLR for a while now (decade or so) and I couldn’t resist the comparison. I’ve had this 300SLR for so long, that I’ve taken out the plastic non-perforated grilled on the front and hood and replaced them with a metal mesh material. 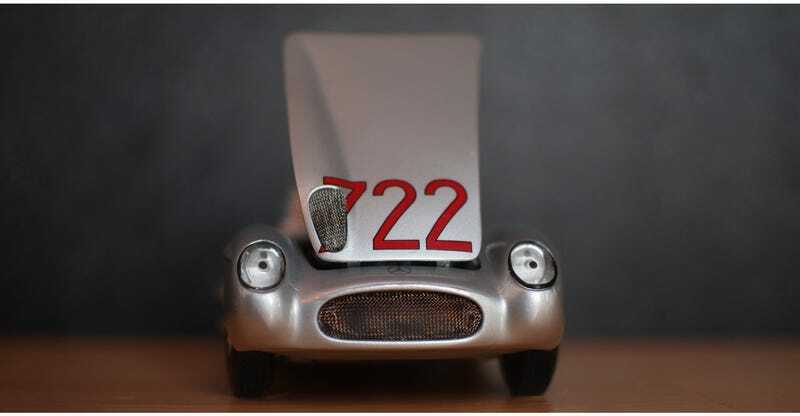 Side-note: 722 stands for the time, in the AM, that Sir Stirling Moss and navigator Denis Jenkinson started their 990mile Mille Miglia journey in 1955. Sterling’s antiquated views aside, the drive was sensational and made him and the car famous forever there-after. Immediately the inspiration for the younger car’s side pipes is to be seen. 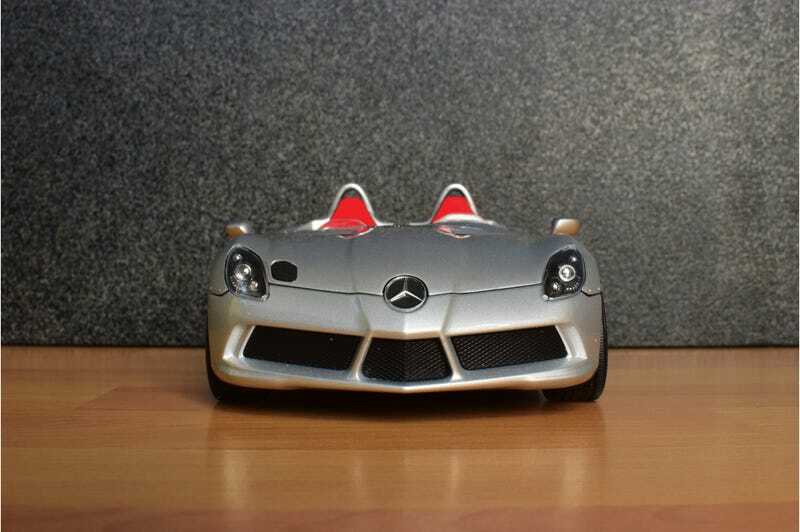 Most racing cars of the period in general, the 300SLR in particular, would have had a Brooklands Screen or two like the newer diecast model does, this 1/18 has a more standard windshield, though cut-down. This 300SLR, being a Maisto, is what we call a ‘Maisto-level car’ and was priced at what we call ‘Maisto-level pricing’, right around $35 in inflation-corrected cashflow. Evidence of this car be seen throughout, from the mounting posts in the headlights to the painted-on rear lights, to the ill-fitting rear humps. But it is a model of a 300SLR, and it has a few very neat details to it that, combined with the sheer look and history of the thing, make me hang on to it tightly as part of my permanent collection. The hood opens up wide and proud to show the slightly canted 3.0 liter straight eight motor, borrowed and upgraded -along with much of the rest of the car- from the Mercedes W196 F1 racing cars of the day. It made around 295hp and made it possible for that famous 1955 Mille Miglia run to have average speeds of almost 100mph. 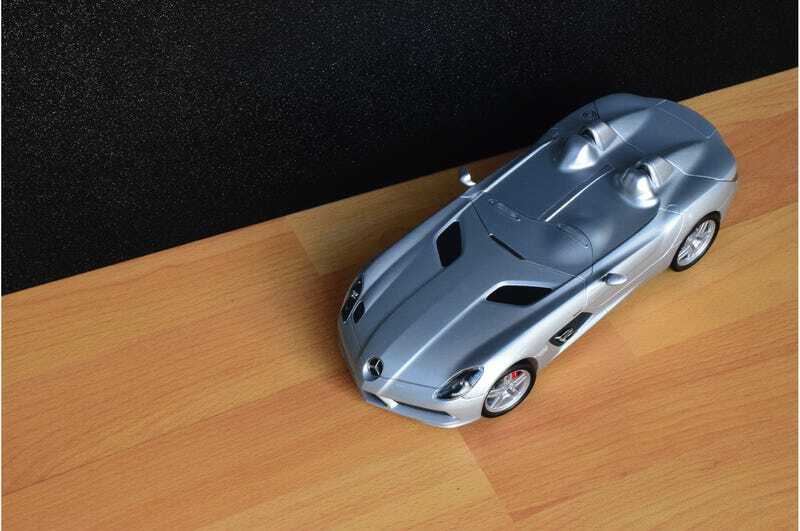 This Maisto diecast also shows a nice engineering solution in the 300SLR. Essentially, the huge drum brakes needed for endurance racing were too big to fit inside the wheels, and were too heavy to have as a part of the suspension geometry. The solution on both the W196 racer and the 300SLR it spawned was to fit the drums well-inside the body, with half-shafts running to the wheels. Maisto doesn’t aim to give us all-faithful recreations, rather they let you buy six or seven models at a time if you are going to spend that kind of money (especially at Costco or Sam’s, amirite?) but this model is a very detailed piece to be had for that price, and I’m certain that the 300SLR Uhlenhaut Coupe from Maisto is equally impressive at it’s currently-available price of around $39, and that is even more of a gorgeous vehicle in every way. Fact. The interior is decently appointed, with very cool tartan patterned seats and a somewhat convincing shifter. The gauges are nicely legible and the door opens. A part of the reason I can show you much of this interior is that the rear humps are removable, and while they are lift-off and not hinged like on the 1:1, they allow access to the trunk to see the two large spare tires. At least that is what we know is under those plastic covers. The drivers side of the 300SLR does not have exhausts, instead it has vents for crankcase and oil cooling. This is an area where all new Mercedes SLRs take a liberty -placing twin exhausts on each side of the car. Well, that really does do it for today, enjoy the rest of your day, and once again I apologize for your mobile data plans!